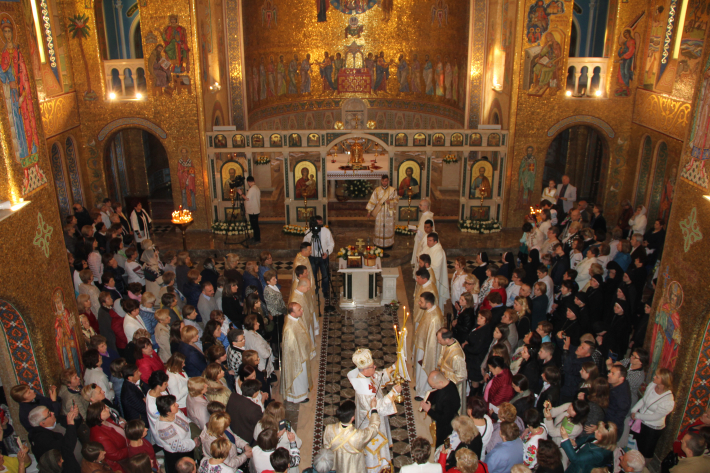 On the Feast of the Resurrection of our Lord, April 8, numerous Ukrainian emigrants arrived at the Cathedral of St. Sophia in Rome. The Hierarchical Divine Liturgy was led by Bishop Dionisij (Liakhovych), the Apostolic Visitator for the Ukrainian Greek Catholics in Italy. He was joined by the priests from the Cathedral as well as those who are ministering or studying in Italy. Addressing the faithful, Bishop Dionisij emphasized in his homily that one could fully enter the Mystery of Christ’s Resurrection only through love. "Christ has resurrected because He loved. Love cannot be killed. Love can be condemned to death, scourged, crowned with thorns, forced to carry a heavy cross, nailed to this cross, pierced in the side so that the remaining blood would flow out, and, finally, be buried. But the law of love – is above all. Love will always resurrect," said the Bishop. After the Divine Liturgy, the Easter baskets were consecrated. And after the dinner, the teachers and students of the school “Saint Sophia” installed and decorated a big pysanka, and sang special Easter songs – hajivky.